Last weekend I picked up another kitten to join Dyson and myself. Previously I have written about how to introduce new cats to each other. Now however, I was going to break all the rules on introducing new cats to each other and their environment. My previous post spoke about introducing cats in stages. And letting the new arrival have their own safe room for a week or two. This would help the two cats integrate slowly and with the minimum amount of stress. This method also helps with scent recognition as this is more important to cats than visual recognition. And whilst growling and hissing is commonplace with this method, flat out aggression is lessened. So why did I decide to break all the Rules? Before I picked up the new kitten (current name Callie), I had to make a decision on how to integrate her with my household. I thought of following the rules but they actually had a few flaws for my current circumstances. Last year Dyson and I moved to a three bedroom apartment from our old five bedroom, three storey house (I didn’t require all the extra space and wanted to move back to the city). So whereas previously I had a spare room that could become a “safe room” as it was rarely used. I now used all my rooms regularly. More to the point Dyson uses all the rooms regularly as she has cat trees in each room and uses each at a different time of day. I therefore did not want to change her routine to much and basically banish her from part of her regular territory. My other main reason was that Dyson has her own bathroom area. Here, I have a Litter Robot which she regularly uses and I also wanted the new kitten to use this box too. Therefore, I did not want her to start using a standard litter box in a completely different area of the apartment. After all, at some stage I would then have to retrain her to use the litter robot. So this sounded like duplicating the work. A big reason for my decision though was Dyson’s personality. Dyson is really a very laid back and very playful cat. Though she does not particularly like change. Therefore this was why I did not want to limit where in the apartment she went. The second main point was that up until last September, Dyson lived with another cat. She had been introduced to my old cat Cobie at thirteen weeks old and had spent her life with Cobie. Sadly Cobie died suddenly last September aged almost twenty. So for the past ten months Dyson had been an only cat but I knew that she enjoyed playing with Cobie. They used to play fight and chase balls together and often slept together as well. I also hoped that some of Cobie’s mothering instinct had also manifested itself in Dyson. Furthermore, the new arrival was going to be a kitten and not a fully grown cat. Therefore, integrating a kitten is easier as they do have the pecking order already set out. 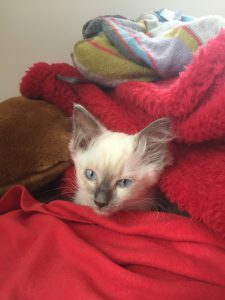 This kitten was coming from a breeder but it was brought up in a home environment and with a number of other adult female cats. Therefore, I hoped that the kitten was used to other older cats and so would not find the transition so traumatic. Did fur fly when I first introduced them? Not quite but it was a bit stressful – maybe for me as much as the cats. I did place the kitten’s feeding bowls in a smaller room and away from Dyson’s food bowls before we started. I also set up a Feliway diffuser a couple of days previously so that the pheromone would have a calming effect. When I brought Callie home I placed her in this small room still in her cat carrier. The carrier I was using had mesh sides and a mesh front letting her see her surroundings. It also gave Dyson the chance to see and smell her. I did rub a towel over Dyson before I went to pick up the kitten and I had placed this towel in the cat carrier on the journey home. Therefore, Callie already had access to Dyson’s scent. I then allowed Dyson to sniff around the cat carrier whilst talking to her and stroking her regularly. There were growls and hisses – mainly from the kitten. After a while Dyson went back to another room at which time I then let the kitten out of the carrier. I showed her, her food and also picked her up and placed her in the litter robot so that she knew where the bathroom would be. However, Dyson now knew that she was out of the carrier so came to investigate. Yes there was growling and yes there was hissing. But I kept talking to both and stroking both at the same time. I did not shout at them if they growled at each other. However, I did give Dyson a lot of extra attention as there was an interloper in her territory. I then fed both of them in their different areas so that acted like a distraction. After that I basically left them to it themselves. If there was growling and hissing then I ignored it. The only time I intervened was when they accidently came face to face and Dyson started yowling and the kittens ears went back. I then just picked up Dyson and gave her lots of attention again. In the first twenty four hours there was growling each time they met. But at night Dyson would come to bed with me as usual and the kitten slept in her safe room. I let her choose wherever she felt safest to sleep. The following day there was still a bit of growling but it was beginning to tail off. Dyson mainly stayed in my bedroom that day whilst the kitten explored the safe room and a couple of other rooms. I did spend a few hours then with Dyson and after a while the kitten also joined us. But Dyson stayed on one side of me and Callie on the other. If they saw each other though there was still a bit of growling but it was lessening and still mainly Callie growling at Dyson. That night followed the previous with Dyson in the bedroom and Callie in the safe room. No more growling. Though there was the odd hiss when the kitten got too close to Dyson. Though, Dyson thought nothing of going straight up to the kitten and sniffing her all over. Now Callie started playing with some of her balls. And I could see immediately that Dyson was interested in playing too but holding back. She was still a little wary of the kitten and to be honest the kitten was a fraction of her size (she is currently only a couple of pounds in weight). They still slept apart but during the day they would now go to sleep in the same room. Especially if I was in the room with them and giving them both positive encouragement. Breakthrough day. Dyson now slept on the sofa with Callie for a while during the day. Though they were still a foot or so apart. Dyson was getting even more interested in the idea of playing together though and a couple of times she went to run and pounce at Callie and then thought better of it at the last minute. This was the day that they also both slept in my bedroom overnight on separate pillows. Well, a week later and I think that my apartment has gone through a tornado. They now both greet each other face to face and both sleep in my bed at night. Though they are still not cuddled up together but I honestly think this will come. Where does the tornado come into it? Well Dyson finally got over her wariness of playing. So this morning they have been chasing each other all over the apartment. They hide behind sofas and then pounce on the other one. They then sprint down the hallway and back into the lounge and around. This went on for over an hour. When I finally thought it had gone quiet I went to find out what they were up to only to find them in my bedroom in a sea of shredded toilet tissue. Yes they had managed to get a roll of toilet tissue out of its’ holder and they then batted it all over the room until it unravelled. They then pounced all over it until they shredded the lot. Well I think as they are playing together that they are going to become friends. They sleep on the same bed and greet each other without a hiss or growl. So would I do it this way again? Well it is definitely dependent on the cats’ personalities. It is also dependent on whether you have a spare room that can be turned over to be a safe room for a week or more. I will admit that if they had started fighting with each other then I would have separated them and introduced the two cats as per the stages method. I did also work from home this week so that I could be with both cats and intervene if required. If I had to be out all week I would have definitely created a safe room as I would have been nervous at leaving both cats alone together. Hi Evie, you have beautiful cats. 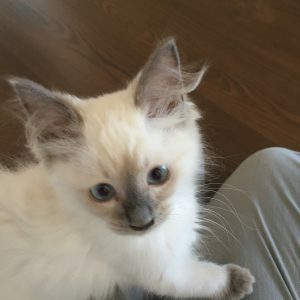 I am definitely a cat person as well, had a cat for more than 20 years. I am glad that introducing the new member went so smoothly, although you say you strayed from what you have recommended previously. I think all depends on the cats, their caracter and what would best work for them and you. I would love to hear more how they are getting on with each other. All the best. Enjoy their company. Hi Ellie. Thank you very much. Dyson and Callie are rather pretty (and I think they know it). 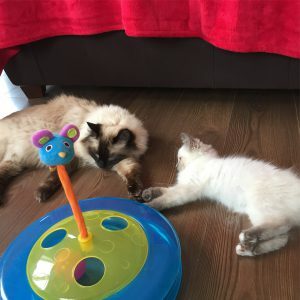 Yes whilst I did stray from previous advice this was mainly because I knew Dyson’s personality and to be honest I knew that she was missing having another cat companion to play with (she loves chasing games). As of this moment they are both in my workroom with a crinkly ball and running around. This morning they acted like a tornado going through the house by chasing each other around (last night they even used me as a trampoline by jumping over me to chase the other). I am really pleased that they are getting on and honestly they are getting on much better than I expected for just one week. first of all–that is the cutest kitten i have EVER seen, and I have had a lot of kittens (I did fostering for a long time). 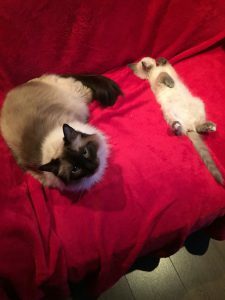 I love your blog–your insight on how to introduce new cats to each other is spot on. We brought home 2 kittens (brother and sister) to our home about 8 months ago and introduced them to the two dogs and the cat–all went well. The dogs LOVED them so much, and the cat was indifferent, although now they all play together, running around the house (and up the curtains!!) Thanks for your great post.